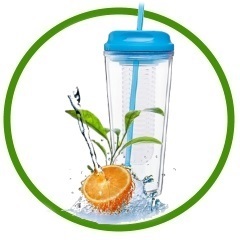 Our Many Infusers | Choose To Infuse™ Your Water, Naturally! 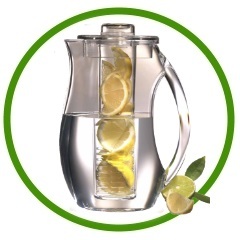 Choose To Infuse™ Your Water, Naturally! Citrus, Berries, Melons, Mint Leaves and other ingredients have all been used in our Infuser Water Bottles, Tumblers, Carafes and Pitchers. 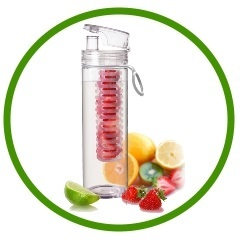 A FREE 'Infused Water Recipe Guide'*, with over 25 recipes is included with each Infuser purchased from our site. We carry a nice Selection of Infusers, with more items added regularly. We currently have 3 Infuser categories to choose from. Please choose one below. Be sure to also view our other Unique and Fun Items. We also offer Full Color Custom Printing of Company Logos and/or Slogans on most all of our Infusers and other items on this site. Custom Printed Promotional Products & Drinkware is part of what we do and we do it well. However, this site focuses mainly on Infuser Products. Contact us for details regarding all your custom print items.